You might call it the Ivy League Robot. 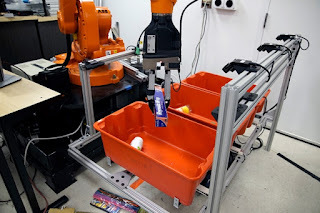 Scientists at Princeton University and MIT have developed a highly advanced robot that can select an object in a bin, pick it up and recognize it. It's a multi-tasking robot that can be put to work in your kitchen or on a factory floor. The pick and place system consists of a standard industrial robotic arm, custom fitted with a gripper and suction cup. What's breakthrough is that 2, separate algorithms tied into a deep neural network (class of learning algorithms) are at work. There's an "object agnostic" grasping algorithm and a new image matching algorithm. Here's how it works. The robot looks into a cluttered bin, selects an object, determines how to grasp it and pulls it out. Cameras take pictures of the object. And with the help of the image matching algorithm the robot can compare the object against a library of images and find the closest match. It's a "grasp first then recognize" workflow that's flexible and effective. Lead researcher Alberto Rodriguez of MIT says these new robots can be used in warehouse sorting but also to pick things out of your kitchen cabinet. He and his team are designing more flexible, adaptable and intelligent robots that can pick and perceive in unstructured settings.